Discovery marks first cosmic event observed in both gravitational waves and light. The discovery was made using the U.S.-based Laser Interferometer Gravitational-Wave Observatory (LIGO); the Europe-based Virgo detector; and some 70 ground- and space-based telescopes. Neutron stars are the smallest, densest stars known to exist and are formed when massive stars explode in supernovas. As these two neutron stars spiraled together, they emitted gravitational waves that were detectable for about 100 seconds; when they collided, a flash of light in the form of gamma rays was emitted and seen on Earth about two seconds after the gravitational waves. In the days and weeks following the detection of gravitational waves and gamma rays, other forms of light, or electromagnetic radiation — including X-ray, ultraviolet, optical, infrared, and radio waves — were detected. The observations have given astronomers an unprecedented opportunity to probe a collision of two neutron stars. For example, observations made by the U.S. Gemini Observatory, the European Very Large Telescope, and NASA’s Hubble Space Telescope reveal signatures of recently synthesized material, including gold and platinum, solving a decades-long mystery of where about half of all elements heavier than iron are produced. The LIGO group in Cambridge consists of eight researchers spread across DAMTP, the Cavendish Laboratory and the Institute of Astronomy. The gravitational signal, named GW170817, was first detected on Aug. 17 at 1:41 p.m. British Summer Time; the detection was made by the two LIGO detectors, located in Hanford, Washington, and Livingston, Louisiana. The information provided by the third detector, the recently upgraded Virgo, situated near Pisa, Italy, enabled an improvement in localizing the cosmic event. Each observatory consists of two long tunnels arranged in an L shape, at the joint of which a laser beam is split in two. Light is sent down the length of each tunnel, then reflected back in the direction it came from by a suspended mirror. In the absence of gravitational waves, the laser light in each tunnel should return to the location where the beams were split at precisely the same time. If a gravitational wave passes through the observatory, it will alter each laser beam’s arrival time, creating an almost imperceptible change in the observatory’s output signal. Theorists have predicted that when neutron stars collide, they should give off gravitational waves and gamma rays, along with powerful jets that emit light across the electromagnetic spectrum. The gamma-ray burst detected by Fermi is what’s called a short gamma-ray burst; the new observations confirm that at least some short gamma-ray bursts are generated by the merging of neutron stars — something that was only theorized before. 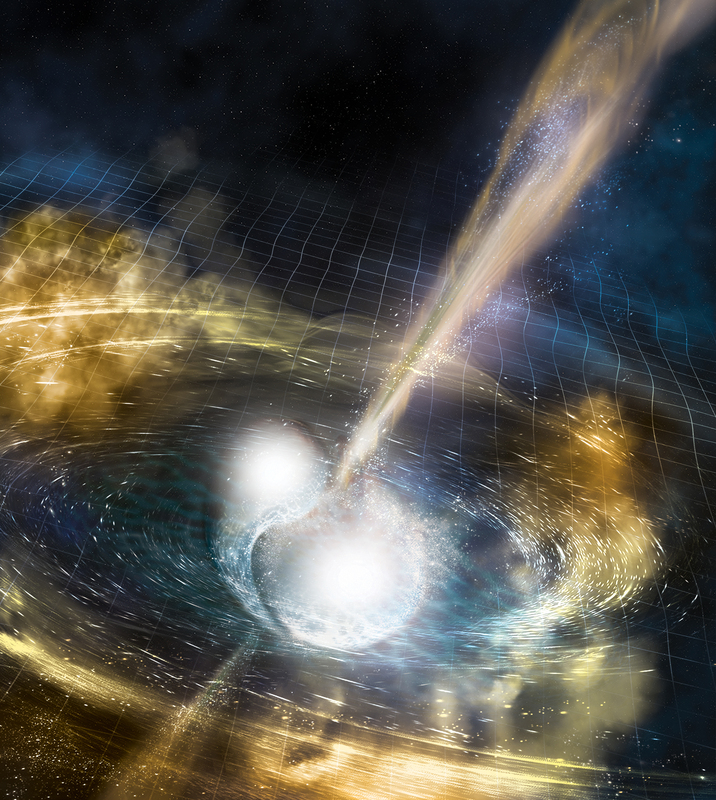 “For decades we’ve suspected short gamma-ray bursts were powered by neutron star mergers,” says Fermi Project Scientist Julie McEnery of NASA’s Goddard Space Flight Center. “Now, with the incredible data from LIGO and Virgo for this event, we have the answer." But while one mystery appears to be solved, new mysteries have emerged. The observed short gamma-ray burst was one of the closest to Earth seen so far, yet it was surprisingly weak for its distance. Scientists are beginning to propose models for why this might be, McEnery says, adding that new insights are likely to arise for years to come. Though the LIGO detectors first picked up the gravitational wave in the United States, Virgo, in Italy, played a key role in the story. Due to its orientation with respect to the source at the time of detection, Virgo recovered a small signal; combined with the signal sizes and timing in the LIGO detectors, this allowed scientists to precisely triangulate the position in the sky. After performing a thorough vetting to make sure the signals were not an artefact of instrumentation, scientists concluded that a gravitational wave came from a relatively small patch in the southern sky. 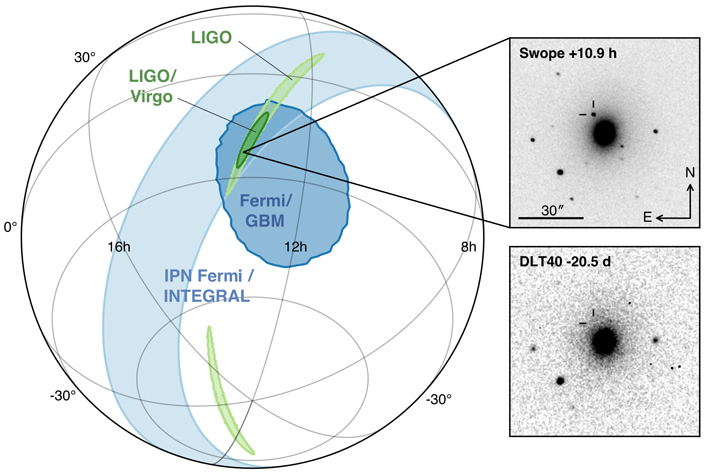 Fermi was able to provide a localization that was later confirmed and greatly refined with the coordinates provided by the combined LIGO-Virgo detection. With these coordinates, a handful of observatories around the world were able, hours later, to start searching the region of the sky where the signal was thought to originate. A new point of light, resembling a new star, was first found by optical telescopes. Ultimately, about 70 observatories on the ground and in space observed the event at their representative wavelengths. “What I am most excited about, personally, is a completely new way of measuring distances across the Universe through combining the gravitational wave and electromagnetic signals. Obviously, this new cartography of the cosmos has just started with this first event, but I just wonder whether this is where we will see major surprises in the future,” says Ulrich Sperhake, head of Cambridge’s gravitational wave group in LIGO. Each electromagnetic observatory will be releasing its own detailed observations of the astrophysical event. In the meantime, a general picture is emerging among all observatories involved that further confirms that the initial gravitational-wave signal indeed came from a pair of inspiralling neutron stars. Approximately 130 million years ago, the two neutron stars were in their final moments of orbiting each other, separated only by about 300 kilometres, or 200 miles, and gathering speed while closing the distance between them. As the stars spiralled faster and closer together, they stretched and distorted the surrounding space-time, giving off energy in the form of powerful gravitational waves, before smashing into each other. At the moment of collision, the bulk of the two neutron stars merged into one ultra-dense object, emitting a “fireball” of gamma rays. The initial gamma-ray measurements, combined with the gravitational-wave detection, also provide confirmation for Einstein’s general theory of relativity, which predicts that gravitational waves should travel at the speed of light. Theorists have predicted that what follows the initial fireball is a “kilonova” — a phenomenon by which the material that is left over from the neutron star collision, which glows with light, is blown out of the immediate region and far out into space. The new light-based observations show that heavy elements, such as lead and gold, are created in these collisions and subsequently distributed throughout the universe. “This is a spectacular discovery, and one of the first of many that we expect to come from combining together information from gravitational wave and electromagnetic observations,” says Nathan Johnson-McDaniel, researcher at DAMTP, who contributed to predictions of the amount of ejected matter using the gravitational wave measurements of the properties of the binary. In the weeks and months ahead, telescopes around the world will continue to observe the afterglow of the neutron star merger and gather further evidence about its various stages, its interaction with its surroundings, and the processes that produce the heaviest elements in the universe.